This is my recent AR-15 pistol build. The upper assembly from CMMG was $700 and features a KeyMod free-float handguard and 8″ medium barrel. It is chambered in .300BLK, which is currently the most versatile and efficient AR-15 caliber for such short barrels. I assembled the lower from a Seekins Precision forged receiver, Phase 5 Tactical pistol buffer tube, Noveske QD end plate, CMC 3.5lb single-stage trigger, and Stark SE-2 grip. Total component cost for the lower was $450. Unloaded weight for the complete firearm is only five pounds. A generation ago sub-machine guns were the middle ground between handguns and full-power rifles. 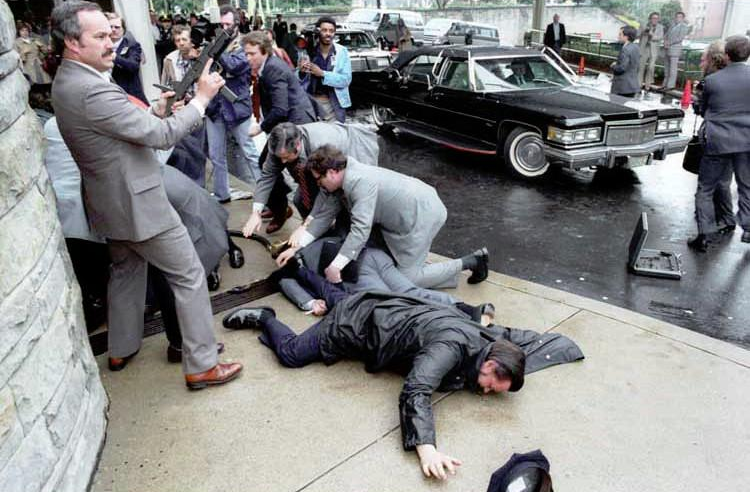 A famous photo from moments after the 1981 assassination attempt on President Reagan shows a Secret Service agent readying an Uzi he had produced from a nearby briefcase. We have since learned that power is more important than volume of fire, and that guns on full-auto with concealable magazines run empty far too quickly. Today the niche between handguns and long guns is filled with rifle-caliber “personal defense weapons” (PDWs), which are powerful enough for a serious gun fight but still portable enough for every day use and potential concealment. The following photos show how an AR-15 pistol can be shot effectively and accurately. When carried with a single-point sling the sling itself can act as a third point of contact: The trigger hand pushes the gun forward and the sling provides stabilizing tension for immediate action. Alternatively, as in the middle photo, cheek contact with the buffer tube provides a more stable sight picture. Finally, it is possible to tuck the rear of the buffer tube back into the shoulder pocket to create a fourth point of contact in a true “Nose To Charging Handle” (NTCH) mount. This entry was posted in Arms on April 19, 2014 by federalist. How do the “pistols” handle over a bullpup? If we’re talking about short-length rifles while avoiding tax stamps I feel like a bullpup would be a more practical choice, especially with the buzz the Tavor has stirred up about bullpups. If I were to go for the “pistol” road, would you suggest getting an AR-15 “pistol” or something without the buffer tube, such as the XCR? Short answer: In principle bullpups beat pistols in everything except concealability. (They also beat standard rifles in everything except, in the case of side-ejectors, cross-shoulder usability.) In practice you can’t customize a bullpup to the degree you can pistols based on the common rifle platforms, which may be a drawback. If you’re getting a pistol the tubeless fourth-gen ones like the XCR are more concealable but harder to shoot accurately unless you add a brace. So unless you actually plan to work a protection detail where you’d actually carry it slung under a concealment garment I’d get an AR-15 pistol because they’re as fun and practical as an SBR. Long Answer: Let’s look at rifles in the “light” (i.e., 5.56mm NATO) class. Full-length: A standard rifle with a 16″ barrel and adjustable stock. Typical weight is as low as 7 pounds and length is at least 36″. Bullpup: In principle these are always superior to traditional rifles: They give you the same barrel length but cut overall length by 8-10″ and vastly improve balance. Typical weight is 8 pounds and length is 26″. In practice they have some drawbacks: Side-ejecting bullpups can’t comfortably be shot cross-shoulder. Mag changes take more practice. The market for accessories isn’t as vibrant — e.g., you can’t find the perfect grip, trigger, and stock like you can on a standard rifle. SBR: Barrels can be cut down to 7.5″, which brings length with stock as low as 24″ and weight as low as 5 pounds. Biggest obstacle to this option is the need to register the gun, which takes $200 and (currently) 10 months. Another drawback is ballistic efficiency: Shorter barrels produce lower velocities. Pistol with brace: AR-15 pistols require a buffer tube, and for the time being the ATF has ruled that fourth-generation “pistols” can be equipped with an arm brace, both of which drop overall length to 22″ with a 7.5″ barrel. These aren’t as effective as bona fide stocks but they can be used to get a three- or four-point mount on the gun. Pistol: This brings length as low as 18″, but unloaded weight is still 5 pounds. Without a sling or improvised support to offer a third point of contact these are tricky to fire with precision. However their purpose is to be a concealable weapon you could depend on for defense, and they still put out the firepower needed to stop determined aggressors who may be using thin cover that would foil a conventional pistol. A full-length rifle is unwieldy. It is designed for hunting, open battlefields, and target shooting. Even professional soldiers prefer short-barrel carbines whenever they have to maneuver and fire from vehicles and close quarters. And of course many other countries use bullpups as standard issue so they don’t even have to consider this tradeoff. I like my bullpups and my SBRs equally. There’s nothing like the balance of a bullpup. The shorter barrel on an SBR helps with balance, but then my SBRs have also been tailored with stocks, grips, and triggers I love. For home defense I prefer SBRs only because I am so much more proficient with them. For vehicles I would see what fits well and can be employed from each seat: In order of preference (1) folding stock, (2) SBR, or (3) pistol. If I had to carry concealed in a high-risk area I would definitely go for one of the “pistol” rifles. If it’s concealable I prefer the AR-15 because the buffer tube offers some advantages. If that buffer tube adds too much length I would move down to a bare fourth-gen pistol. Even shooting one-handed that’s going to disrupt an attack as fast as a full-length rifle, and long enough to move to cover or drop prone where it can be fired from support. But keep in mind that even that fourth-gen pistol rifle has nothing like the practical concealability of a traditional pistol. Unless you might be working a high-risk concealed protection detail I consider it a relatively impractical novelty. However, if you are considering registering an SBR you should definitely start with a pistol receiver. That way you can legally add and remove a stock. My understanding is that if you register a rifle receiver then current ATF rules state that you cannot legally convert it to a pistol later by removing the stock. (And what’s the legal difference between a “pistol” and “rifle” receiver? The former was first built or transferred as a pistol.) For further clarification on this I recommend the NFA Talk forum. I always enjoy a lengthy reads, especially ones that I agree on. Bullpups are the solution to the two most common gripes I hear about standard rifles, difficulties keeping on target and difficulties using in tight spaces. It’s almost a shame the U.S. military is so massive, smaller countries have managed to either start to adopt or completely adopt bullpups as their standard rifle. However I’m also curious as to how well a bullpup covers the precision rifle role. It seems that when firing from prone the balance of a rifle doesn’t seem relevant, in fact wouldn’t being front heavy assist the shooter when firing from a bipod? I don’t own a bullpup myself(yet!) nor have I any first-hand experience firing a bullpup intended for precision use, but from your experience, with both the SRS and MRAD, what’s it like precision shooting with the bullpup layout vs standard layout? Yeah, I’m usually sold if it’s good enough for the Israelis (like the Tavor); not to mention the 40+ other countries that use the Steyr AUG.
For precision bolt guns it seems to come down to personal preference. I know a lot of serious, competitive, long-range shooters. Most have tried the DTA bullpups and still prefer traditional guns. Part of that may be that it’s a little harder to work the bolt that far behind the trigger, or see what’s happening in the action and mag-well without lifting completely off the gun. (And of course it’s a non-starter for most left-handers). Part of that may be, again, that you can’t customize a bullpup as easily. DTA has been trying to make length-of-pull and cheek height more adjustable, and their trigger is remarkably adjustable, but even so you can’t do much with the grip. Compare that to the MRAD, where you can really get everything just the way you like it, or with custom builds, which is what most competitive shooters end up with. As you note, balance isn’t really an issue for these guys, even though they occasionally have to take offhand shots, because almost all shooting is supported. One thing that I found interesting is that the rail length is not one of the issues precision shooters have with the DTAs. Current best practice seems to be to put the bipod closer to the center of mass to avoid hop, but once the gun is supported nobody seems to care whether that center is close or far from the trigger. So even on my short-railed SRS Covert the bipod works best mounted closer to the trigger than the end of the rail. I haven’t shot the latest “sniper” competitions that require a lot of movement and positions with the gun, but my guess would have been that the shorter length and balance of a bullpup would be a real advantage. Another thing that might be working against DTA is that the only mags available are still only 6 rounds, whereas I think most competitors are using 10-round mags. Yeah bolt action designs aren’t very lefty friendly to start with, but pair that with the inherently left-unfriendly design of a bullpup and you get a lefty/cross-shoulder nightmare. Though the aftermarket of bullpups is growing it’s still nowhere near the aftermarket of standard rifles. I don’t really know why there hasn’t been a bullpup that I’ve heard of use AR-15 grips, other than many bullpups incorporate handguards into the grip. Interesting to hear about the positioning of a bipod on a SRS, I never had thought of it like that before. I think the aftermarket J-Tactical Rogue chassis for M14 receivers also takes AR grips. That’s on my (long) list of guns to look at. But yes, in general the gun industry is strange, often very slow to capitalize on niches and improvements, or incorporate best practices. Many of the innovators are single-man or single-owner operations that don’t have much business savvy, and aren’t interested in accepting outside help. Believe me — I’ve tried! I completely forgot about the UTS-15. I’ve arrogantly ignored much of what is said about it, I’ve never really heard much of anything good about it. Kel-Tec products are ordinarily riddled with issues, but it seems the UTS has surpassed Kel-Tec in bad reputation. The Rogue looks bulky, much like the UTS. Is it coincidence they both are bulky and use AR-15 grips? I wouldn’t imagine bullpups with AR-15 grips have to be of a certain design to accommodate the grips but I could be wrong. First and foremost, congrats on having a great blog with fantastic posts. I find all your articles very informative and well written. I’ve been contemplating on building a AR myself, this would be my first. I am very confident as to building it, I have worked on many “already built” AR’s. Now I’m torn between building a traditional AR or a pistol build. I have all the parts I need in thought, and ready to order. One question, when buying a SBR upper or short barrel for a pistol lower, is that constituted as a NFA item if its going on a pistol dedicated lower? Can I just order it online and build the pistol? Your thoughts and advice would be greatly appreciated for a first time builder! The great thing about SBR uppers and barrels is they are not regulated. It’s up to you as the buyer to comply with the law — which you do by ensuring you own (A) at least one “pistol” lower, (B) a registered SBR lower, or (C) no unregistered rifle receiver capable of using the upper.